Summer is a great time to make shawls, mittens, hats, socks, anything that is lightweight, portable and requires minimal concentration. 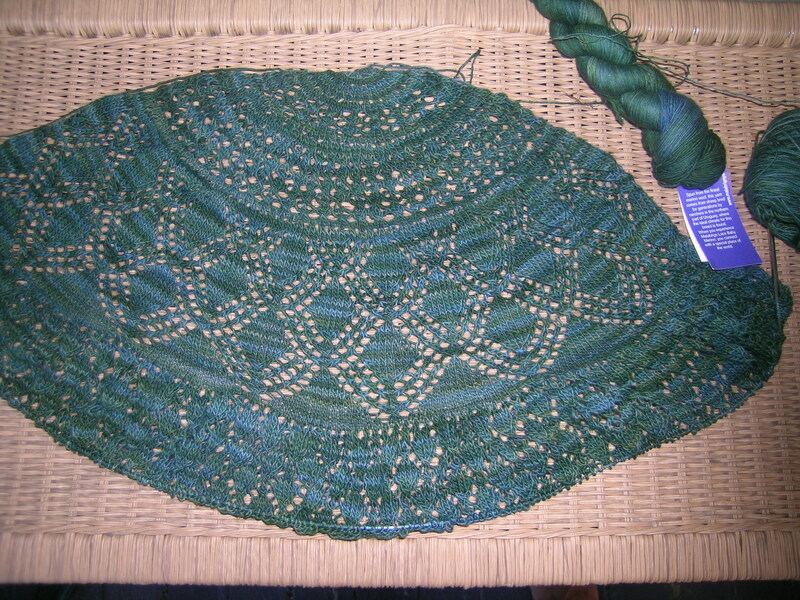 Having just finished my Lupine shawl, I had another ready to go. I had purchased some Malabrigo lace weight yarn in the color VAA (not sure what that means), to make my husband the Henry scarf last summer. My senses got the better of me, and I switched to the Malabrigo sock weight yarn for that project, otherwise I might still be working on it and cursing it. This color is a dark hunter green, and on closer inspection, has teal blue highlights. In the hank it was not one of my favorite colors. I chose to make the Vernal Equinox Shawl, a beautiful free pattern that I saw on Ravelery. It had initially been a KAL there. That would have been fun to participate in. I am still trying to figure out how to best take advantage of all that Ravelry has to offer, and find what I need or would be interested in. So, I cast on, and loved how the yarn is knitting up. This is my first project with Malabrigo lace, and it is really a wonderful yarn. Did I expect any less, as their sock yarn has become my go-to for most sock projects these days. The color was also a very pleasant surprise, and I love how the green gradates, with blue coming through on a fairly regular basis. I think that this will be gorgeous when all blocked out. The shawl pattern is very well written, easy to follow, and becoming a quick knit. Taking it with me on a day road trip today.